Baking soda is a leavening agent that is used in cooking and baking to make food rise. It is also known as Bicarbonate of Soda and Sodium Bicarbonate. Baking soda is found in all living things to help provide a natural pH balance.Using pure baking soda for cooking is a popular application for this material. First, a quick chemistry lesson on baking soda. It helps food rise this by releasing carbon dioxide bubbles. This expands the dough or batter, creating a fluffy product. It forms the texture and grain in pancakes, cakes, bread, and other foods. When mixed with acidic compounds such as buttermilk, vinegar, yogurt, or lemon juice, it will create the reaction that releases the carbon dioxide. In addition to being a popular ingredient found in many baking recipes, having baking soda on hand can be useful in the event of a kitchen fire. Got a small grease or electrical fire? Throw some sodium bicarbonate on it. Just don't use it on deep fryer fires, as the gas release could cause a harmful splatter. Scuff marks on the floor or grease spills can be cleaned by sprinkling baking soda on the area and wiping it up with a warm, damp washcloth or towel. Here are a few more things to know about baking soda, and how to use it in the kitchen--even if you're not preparing a meal. 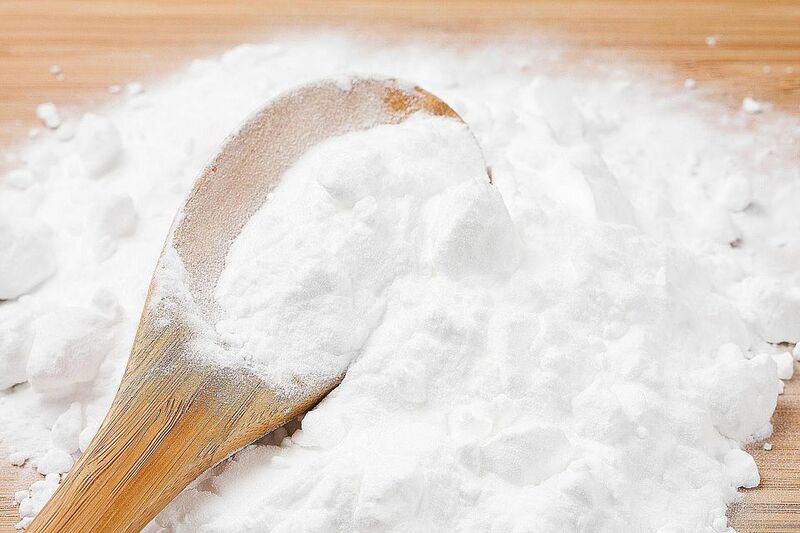 Don't get baking soda confused with baking powder--they are different ingredients all together. Many forms of baking powder, which is different than baking soda, include sodium bicarbonate with other compounds. In addition to using baking soda for cooking and baking, it can also be used in refrigerators and other odor-prone areas because it is a natural deodorizer. If you're cooking or baking, you probably have to clean up. Want a natural cleaning product that is relatively inexpensive? Mix baking soda with some warm water to clean aluminum items such as baking sheets. It can remove tarnish from silver if the silver comes into contact with aluminum foil. Stained enamel cookware can be renewed by scrubbing it in a baking soda/water mixture. Baking soda is also used with cold water to remove surface rust. (Hot water can corrode steel). It is also useful when mixed with warm water to clean tea and coffee stains from the inside of mugs. Got a clogged or overall dirty sink and want to clean it naturally? Sprinkle a few teaspoons of baking soda down the drain and splash some white vinegar on top. It will fizz up and clean the pipes, often removing clogs at the same time. The chemical reaction of creating carbon dioxide doesn't start until the baking soda hits 80 °C or 176 F, so batter at room temperature will not start producing carbon dioxide until you put it in the oven.